Ginger Snap is a delicous and easy biscuit recipe. 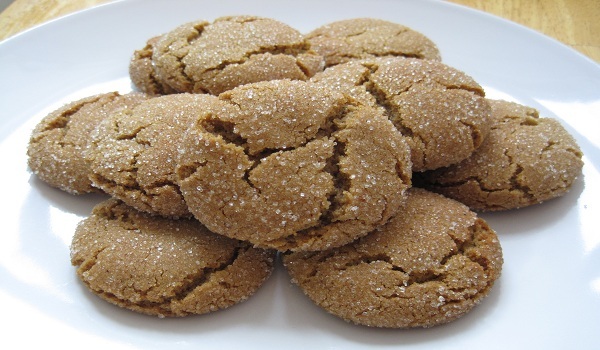 Learn how to make/prepare Ginger Snap by following this easy recipe. First of all, you can preheat the oven to 350 degrees F (175 degrees C). Sift the flour, baking soda, ginger, cinnamon, and salt into a mixing bowl. Stir the sifted mixture to blend evenly, and sift one more time into another bowl. Take one more bowl and put the shortening in and beat until creamy. Beat in the white sugar slowly. Then beat in the egg and dark molasses and sift 1/3 of the flour mixture into the shortening mixture. stir it to blend. Sift in the rest of the flour mixture, and mix together until a soft dough forms. After that, pinch off tiny amounts of dough and roll into 1 inch diameter balls between your hands. Now, you can roll each ball in cinnamon sugar, and place them in 2 inches distance on an ungreased baking sheet. Bake in the preheated oven until the tops are rounded and slightly cracked, about amost 10 minutes and cool the cookies on a wire rack. Store in an air tight container to keep it fresh.